The eager walkers gathered at Grewelthorpe, meeting outside the closed Crown Inn to enjoy Ron’s, as usual, very welcome bacon butties. They set off promptly at 8.30am, but, worryingly, initially struggled to locate the planned footpath (not an ideal start) sensibly deciding instead to follow a suitable track to link up with the Ripon Rowel route. By now the sun was shining and their spirits were further lifted with Andy’s announcement that he had a large Pork Pie in his rucksack. The small village of Ilton was passed, then a very hilly down and up section as they made their way, with a brief detour, to the eerie surroundings of Druids Temple. 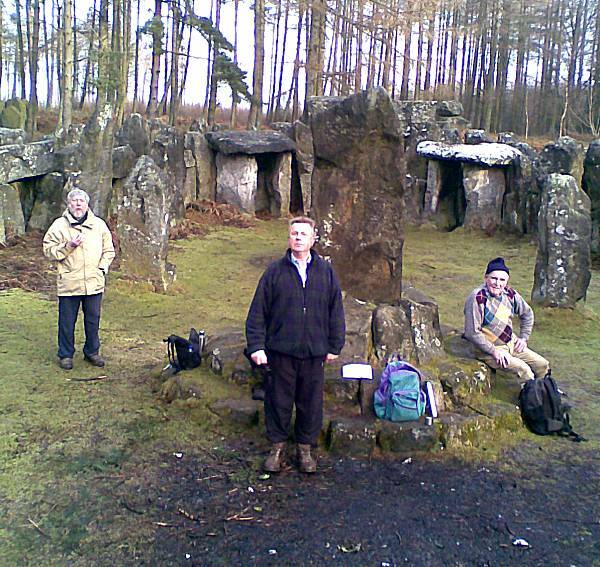 Brad declined to be sacrificed at the alter at Druids Temple, the walkers instead deciding to devour Andy’s particularly tasty Pork Pie. After a brief stop to enjoy the views over Leighton Reservoir, progress continued down through Druids Plantation to rejoin the Ripon Rowel and onward to their lunch stop at the Black Swan in Kearby. 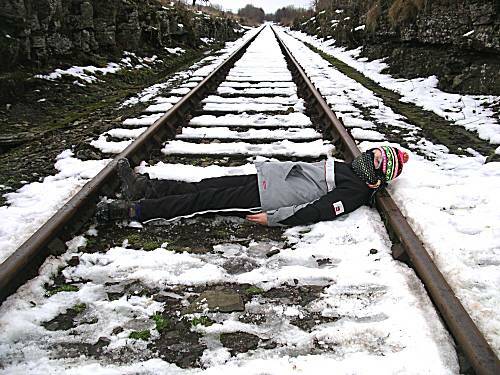 The slight route extension to Kearby, had been recommended to avoid a planned Masham stop, as the pubs there were surprisingly reported as not being to their exacting standards. Paul met up with the others at the Black Swan (his knee not quite recovered enough to join them for the walk) and promptly negotiated a preferential rate for chips to accompany the Black Sheep Ale. After refreshments, Paul’s wife arrived to collect him and kindly offered to drop them all at Masham, a couple of miles away to return them to the original route, an offer that was gratefully accepted. Following the Ripon Rowel route, they continued alongside the River Ure as far as Hack Fall Woods, taking then a steep incline up from the river to join the path down back into Grewelthorpe, arriving at 4.40pm. The sunny weather had been very kind on what proved an enjoyable walk, albeit quite hilly and tiring in parts, with Brad being heard to remark, when nearing the end, that he was well and truly kn***ered. Weather: A sunny and very pleasant walking day for January. 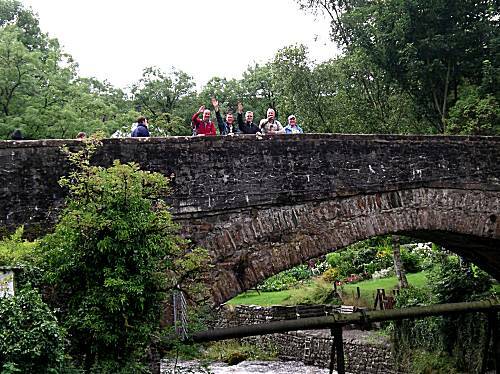 Most of the walkers arrived at Barden Bridge early in nervous anticipation of the strenuous walk ahead of them. Cliff arrived with nerve calming Bacon and Sausage Butties, which were rapidly consumed and much appreciated by all. Paul had rejoined the walkers for the first time following a period of recuperation after knee surgery. The route took the walkers along the river towards Bolton Abbey, pausing briefly to admire the fast flowing 'Strid', where the walkers resisted the temptation to throw Brad into the river to see how well he might have faired through the rapids. The river was crossed at Cavendish Pavilions to start the long ascent towards Simon's Seat. The Valley of Desolation section of the ascent was accomplished by the experienced walkers without undue stress, before they continued upwards into the cloud. 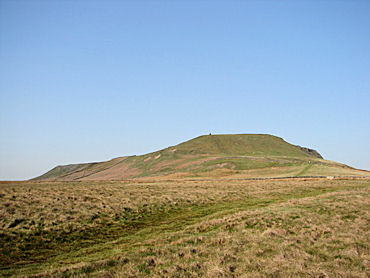 Their leader efficiently guided the team through the poor visibility to reach their goal at the top of Simon's Seat. Unfortunately the amazing views could not be admired, before they picked their way down the steep and slippery rocky path of the infamous north descent. The treacherous pathway proved taxing for the walkers with Brad falling twice and causing much distress to Paul's repaired knee. 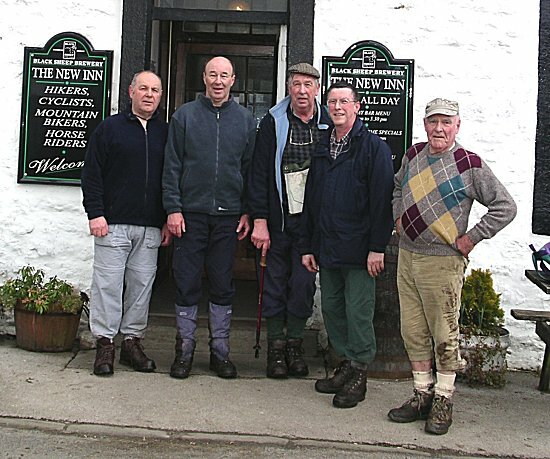 The skilled leader selected the most direct route to Appletreewick where the jubilant walkers gathered at the New Inn for welcome refreshments of Black Sheep Ale with small portions of chips. 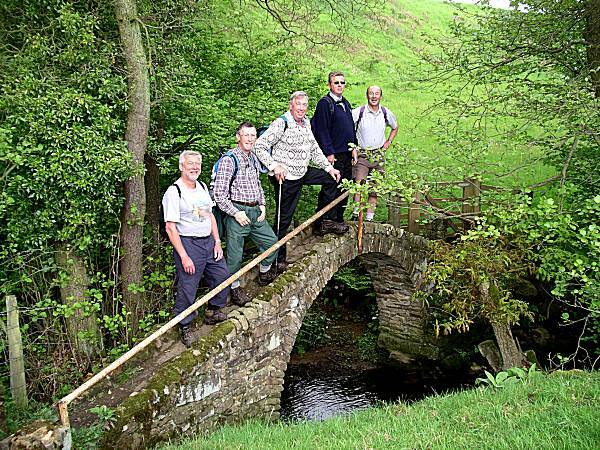 Paul wisely decided to walk no further and was left at the pub to consume further knee repairing ale, while the remaining walkers made their way back to Barden Bridge alongside the river. The walkers departed for their homes after what was generally agreed to be a most enjoyable, but strenuous walk. The walkers met adjacent to the bus shelter in East Witton, where Cliff had arrived first with the Thoralby contingent, but advised that he had received a better offer for breakfast and rapidly departed to enjoy a full breakfast with his "walling" friends, claiming to catch up with the walkers later. 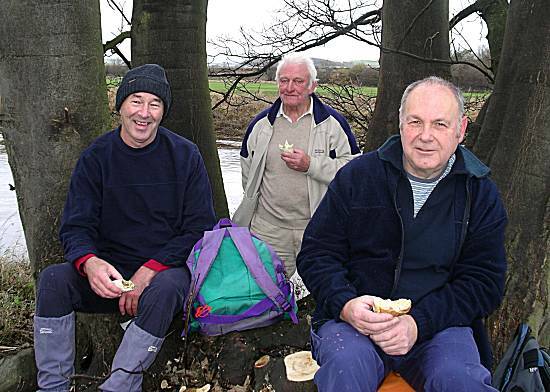 The dejected walkers consoled themselves with Ron's excellent Bacon Butties before setting off through the village with Paul the designated temporary leader. The route took the walkers west slowly converging towards the River Cover by Hullo Bridge and then onwards using a "Permissive Path" crossing the river at Coverham. Alan's progress was slow, but his spirits remained high, knowing that he was heavily laden carrying both his and Ron's Pork Pies, together with ample supplies of chocolate crispies. 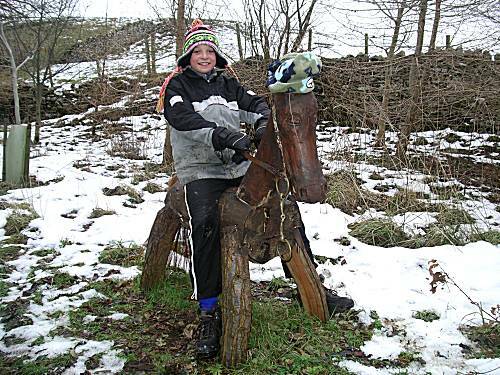 They slowly climbed passing Agglethorpe to reach the "Gallops" at Middleham. The familiar steep decent down the bank toward Bolton Hall was accomplished in worsening weather and the walkers sheltered before Lords Bridge, where they were amazed to find that Paul had also brought what turned out to be an enormous pie. This was rapidly cut into large segments and thoroughly enjoyed. 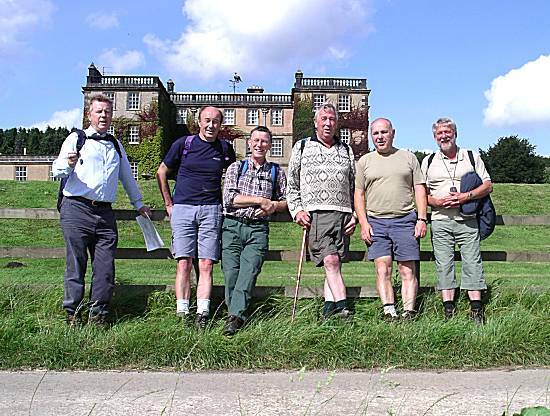 On reaching Bolton Hall the walkers realised that they might reach their planned lunchtime stop at Wensley far too early and therefore added a significant detour to the north. Within a mile of Wensley the walkers were relieved to see Cliff walking towards them and on meeting with him excitedly exchanged stories of large breakfasts and enormous pies. 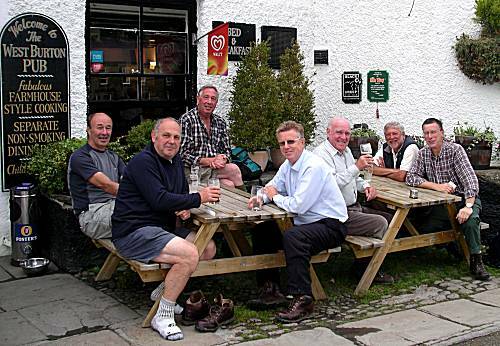 The walkers arrived at the Three Horseshoes which had been re-opened, only the day before, by Andy's son. 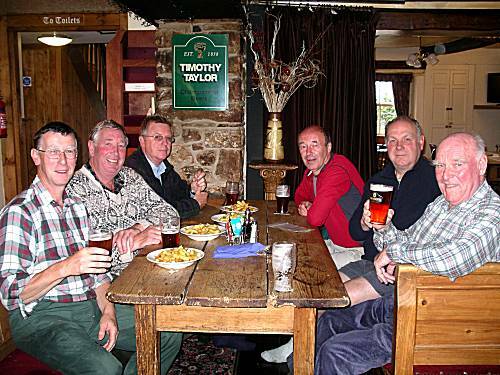 The walkers were delighted to find Timothy Taylors Landlord ale on offer, which proved much to their liking, along with generous portions of chips. 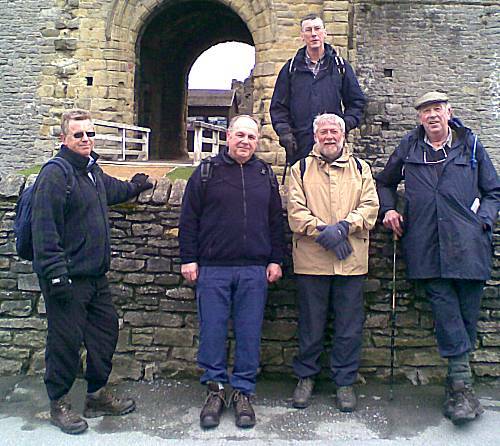 After departing the pub, vowing to return soon, the walkers followed the River Ure to Middleham, where they were seen posing in front of the magnificent castle. Shortly afterwards they found time to compare the quality of the meat and pastry between Ron's Elite Meats Pork Pie and Alan's Illingsworth Pie. The walkers, in their current state, were unable to make any critical analysis of the pies and agreed that they both tasted good. Leaving Middleham heading back to the car at East Witton they had to cross the fast flowing River Cover using the treacherous stepping stones. Cliff can be seen here using all available concentration to enable his safe passage. Arriving back at East Witton the relieved walkers posed by the bus shelter, while the Thoralby contingent awaited arrival of their transport home. Weather: Cold and windy with some rain, but improved later. 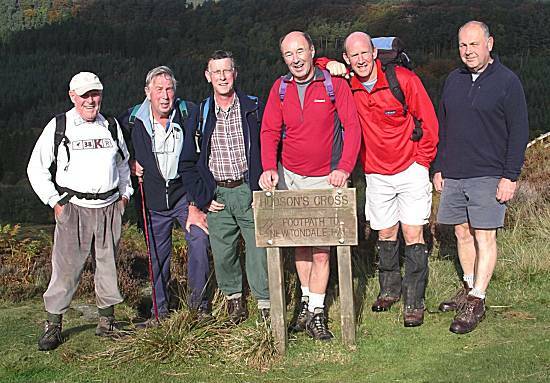 Walkers: Cliff -Leader (Part Time), Neil, Alan, Ron, Andy & Paul. Brad was unable to attend due to lack of transport following a car accident a few days earlier. 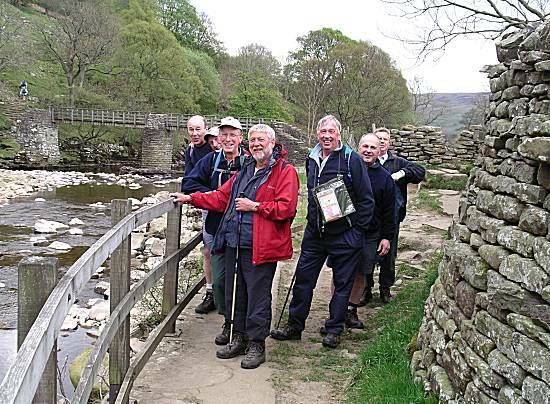 The walkers met at a lay-by close to the village of Low Row some 4 miles west of Reeth, where Cliff's excellent Bacon & Sausage butties were thoroughly enjoyed. Confusion regarding the correct route was swiftly dismissed by Cliff, as the walkers started their steep ascent towards Whitaside Moor. The climb continued, as the pathway gradually disappeared, crossing Summer Lodge Moor, passing numerous old lead mine workings and eventually reaching the dizzy height of over 1700ft, with excellent views down Swaledale. The walkers then successfully crossed "Bloody Vale" to stop for refreshments near Spout Gill, before making their way down into Muker where they rapidly made their way to the Farmers Arms. 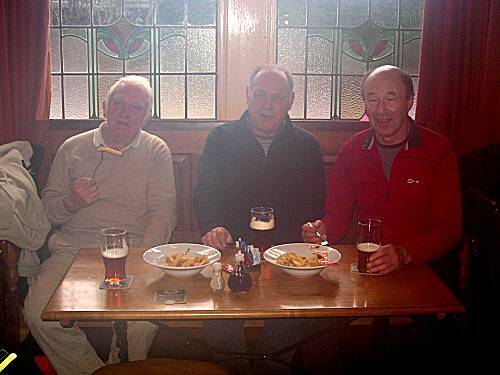 Cliff negotiated a chip deal, whilst the others enjoyed the excellent ale. 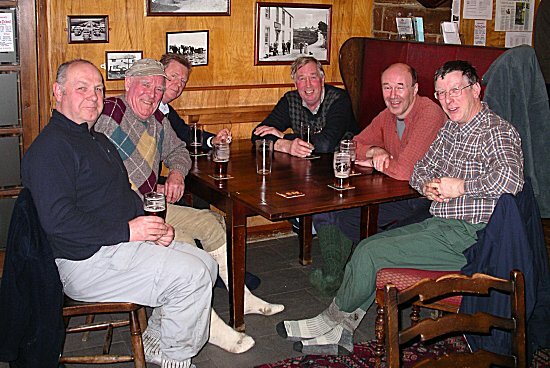 They later moved indoors to view the lashing rain through the windows in the comfort of the pub. 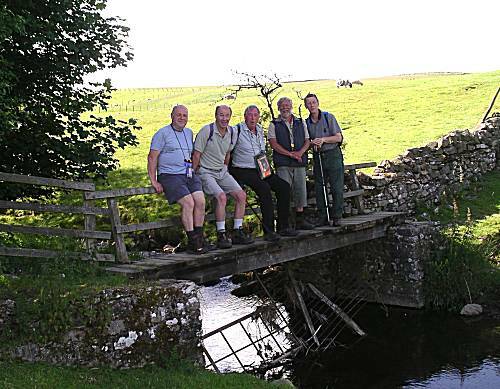 Leaving Muker, in only light rain, the walkers made their way to the footbridge to pose for a photograph by the River Swale. 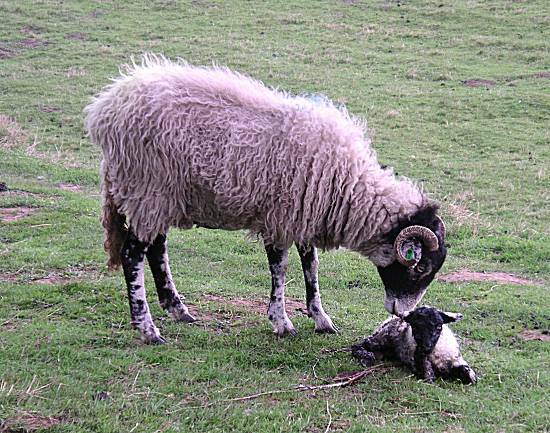 Later on their journey towards Gunnerside the walkers stopped to watch the attempts of a Ewe to encourage her newly born lamb to get to its very wobbly feet. Before reaching the cars the walkers paused to share the remaining Pork Pie rations, before successfully reaching their destination. 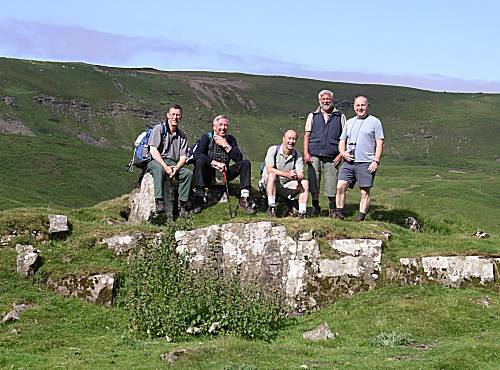 The walkers reflected that the walk, although tough, had been very enjoyable and agreed to meet again on the 23rd May to attempt yet another expedition. Weather: Warm and pleasant, but showery in the afternoon. 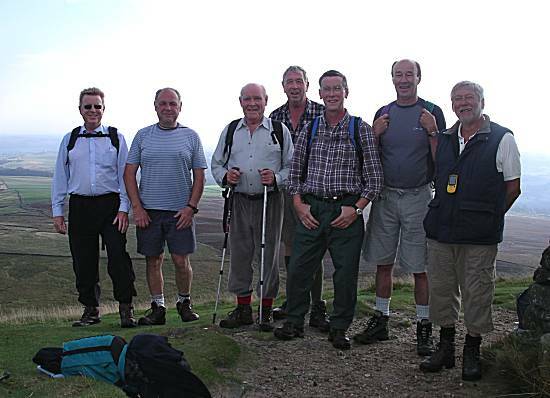 Walkers: Cliff (Leader), Neil, Sean, Alan, Ron, Andy & Paul. All the walkers arrived early at the car park close to the embankment/dam between Swinsty & Fewston reservoirs, where they eagerly awaited and consumed Alan's bacon and sausage butties. They set off following Swinsty Reservoir admiring several bridges on route, stopping at intervals to photographically record the happy events. Their leader had calculated a southerly Otley direction route following the River Washburn to eventually reach the Lindley Wood reservoir. At the end of the reservoir they crossed the bridge to make their way back along the other side. After a steep climb the walkers sort refuge in a modern church grounds where the first of Andy' pies was divided equally between the six walkers. Considerable energy was gained from this refreshment, which enabled the walkers to continue following the line of the reservoir and again upward to reach their lunchtime destination at the 'The Sun Inn' near Fewston. 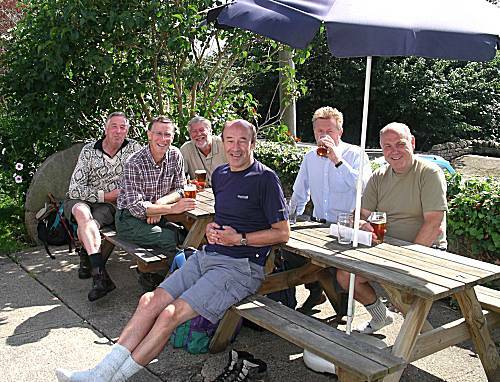 The ale proved to the liking of the walkers, who sat outside admiring many powerful motorbikes which arrived and departed at regular intervals. A discussion with a friendly lone biker on an adjacent table took place regarding the various merits of the tread patterns (or lack of) on the bikes. A successful chip negotiation resulted in three bowls of excellent quality chips arriving, to complement the ale. 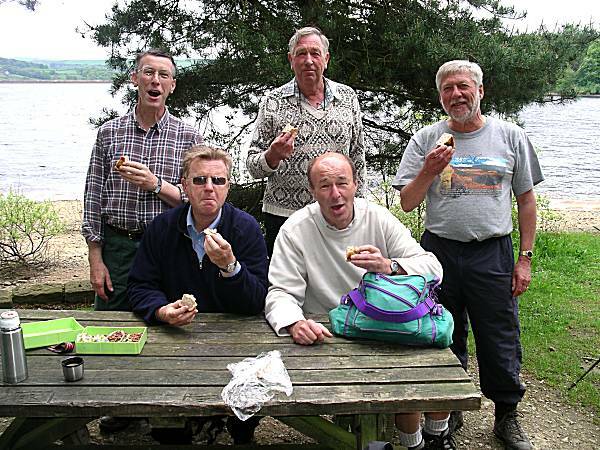 After the lunchtime stop, the walkers quickly made their way to a picnic area, where in high spirits (except Ron), they finished the remaining pie and chocolate crispy rations, before the Thoralby contingent left for their cars, to fulfil their "Home Early" instructions. 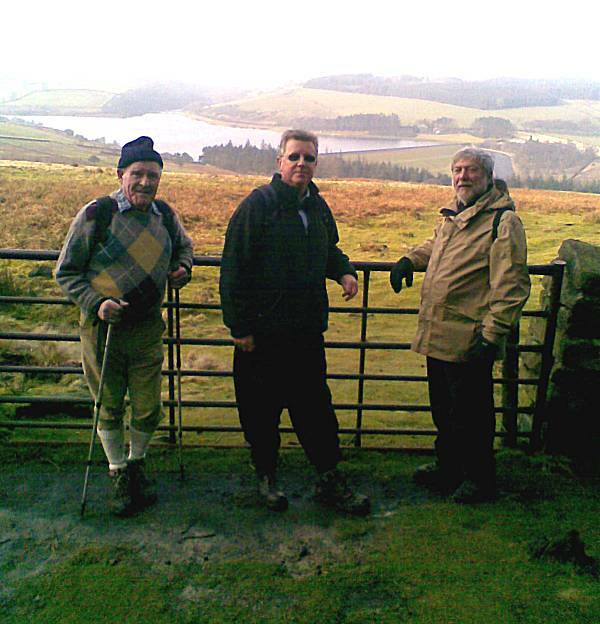 The remaining hardy walkers completed the entire route by circumventing the top end of the Fewston Reservoir right up to the A59 at Blubberhouses, before returning to the car park where they rewarded themselves with excellent ice creams, without 99's. 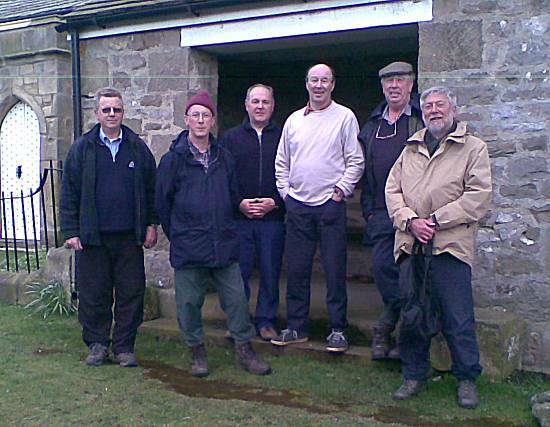 Walkers: Neil (Leader), Cliff, Alan, Ron, Andy & Paul. The walkers gathered at a small parking area close to the bridge in the centre of Marske and after consuming Cliff's excellent bacon & sausage butties, set off following the path of Marske Beck. Most of the following miles took the walkers steadily upward in very warm weather causing much exhaustion, which could only be cured by portions of pie, but the temptations were resisted. The walkers quickly gathered on a hillock during their arduous journey, but the feelings of exhaustion were hidden from their expressions, knowing that the levels of food rations remained high. The route continued to climb to dizzy heights exceeding 1500 ft above sea level, where they passed numerous old mine workings which had distorted the horizon to resemble the surface of the moon. Just before the path dropped rapidly towards Arkle Beck, the walkers stopped by a wall and gate to enjoy Andy's first pie, which had been accurately pre-divided into five equal portions. Alan shared his entire ration of Mars Bar Crispies with the group, as the high temperatures were causing some softening of the product. As is customary, the walkers cleverly located more interesting bridges on their journeys and felt need to test the bridge strength and record the events. 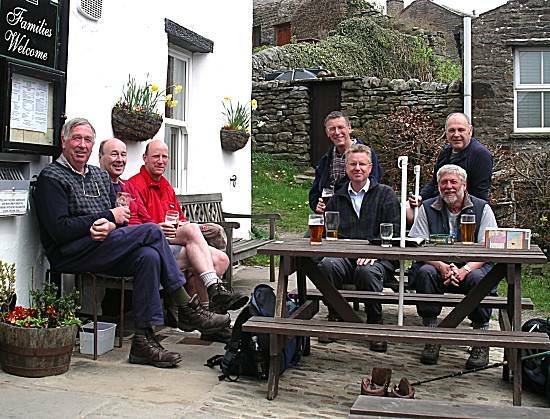 Arrival at the Bridge Inn at Grinton was not a minute too soon, where the walkers were seen enjoying several pints of Cumberland Ale and moderate portions of chips. However their enjoyment was prematurely cut short by firm instructions from the leader to commence the final leg of the walk. Grave concern was directed at Cliff for such an un-characteristic instruction, but the obedient walkers complied. 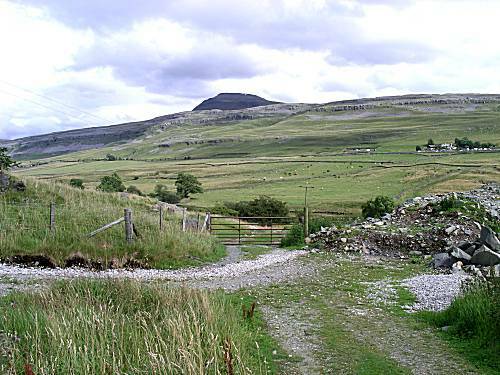 The following section of the walk initially traced the River Swale downstream until the path turned sharply upward by the remains of Marrick Priory (Benedictine Nuns) to climb a long flight of steps to eventually reach Marrick Village. The walkers felt need to locate the converted church where some 2 years earlier they had purchased Ice Creams from a very pleasant lady. They were welcomed into their back garden to enjoy their Magnums and share their last pie in the comfort of a sunny seated area. Greatly refreshed after their rest the final few miles downhill back to the cars at Marske rushed by, where in high spirits they rapidly arranged a date for the next walk and departed to their homes, knowing that another expedition had been successfully accomplished. 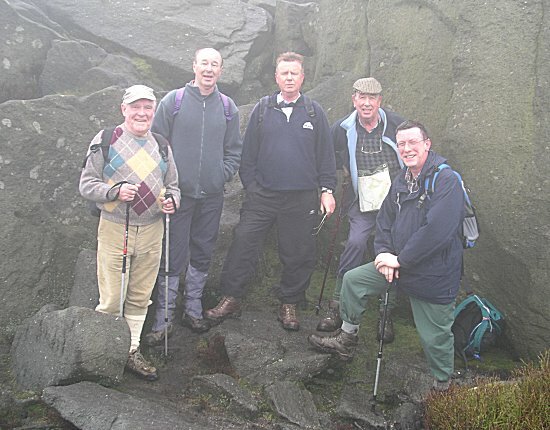 Walkers: Cliff (Leader), Neil, Alan, Andy & Paul. Distance 14 miles with masses of climbing in the pouring rain !!! 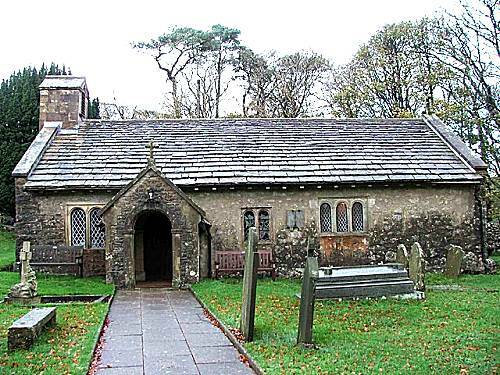 The walkers arrived together, 15 minutes ahead of schedule, at a small church car park in Chapel-le-Dale, before bearing the heavy rain, to enjoy Ron's bacon and sausage butties. The walkers were quick to realise that Andy was not with the group this day and their thoughts immediately turned to the fact that Andy had been previously designated PieMan and that they may have to endure the whole walk without the benefit of Pork Pie!!! 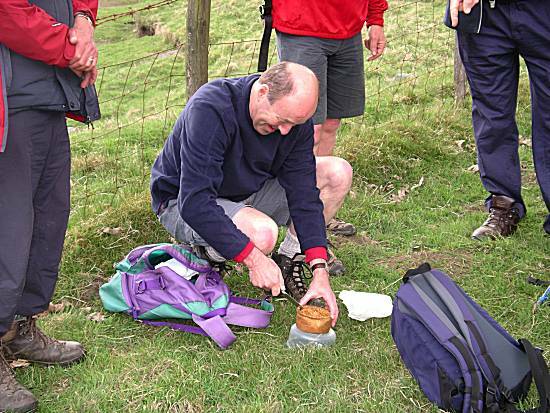 Paul quickly reassured the group that the said Pies had been entrusted to his safe keeping, to the obvious relief of the other walkers. 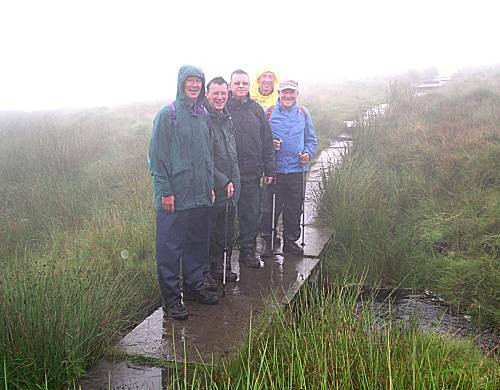 Having donned all available weatherproof clothing, the walkers set off to find the solitary path leading up into the clouds towards the summit of Ingleborough 2,373ft. The walkers were amazed and impressed to find the whole route up Ingleborough had been flagged, to reduce erosion of the hillside. On the lower slopes, in the thick mist and heavy rain, they quickly gathered on a small bridge to record the event. 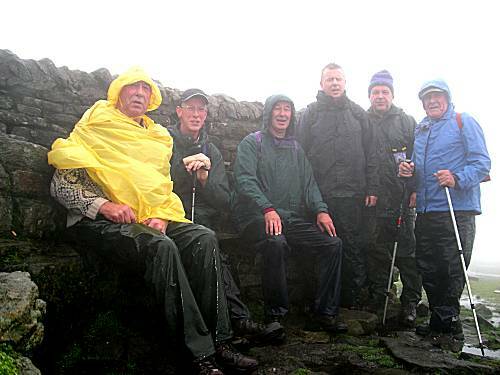 After much energy had been consumed the walkers, including Brad, reached the wind shelter and the top of Ingleborough 2,373ft, where no views of Yorkshire were visible. The walkers resisted temptations to sacrifice Brad at the top, as uncharacteristically he had not slipped or fallen over during the difficult climb. 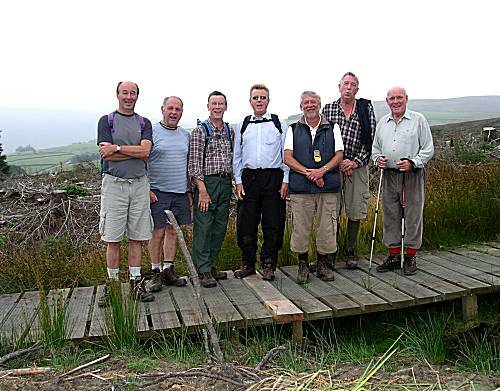 Having conquered Ingleborough, the walkers commenced the equally difficult and treacherous descent towards Ingleton. Brad managed the descent perfectly until he slipped just 20 yards from the road at the bottom. 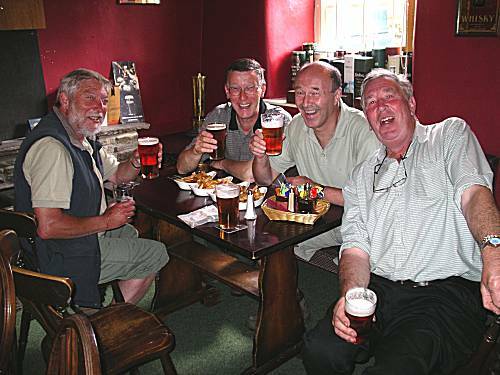 They hurried through Ingleton and out the other side to the village of Thornton-in-Lonsdale, where opposite the church they found the Marton Arms, which stocked an enviable range of Real Ales, much to the approval of the walkers. 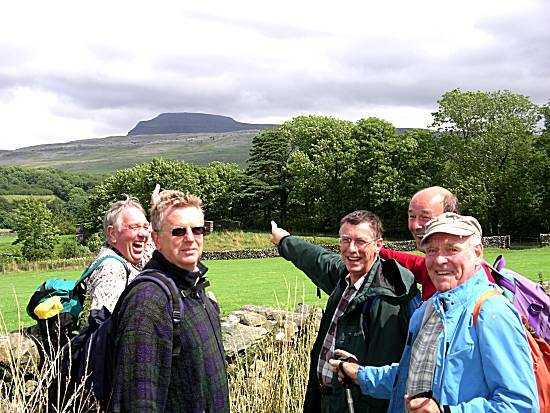 Leaving Thorton-in Lonsdale in high spirits, except Ron, the walkers gazed at the peak of Ingleborough, now clearly visible, knowing that they had successfully climbed this peak in intolerable conditions that morning. 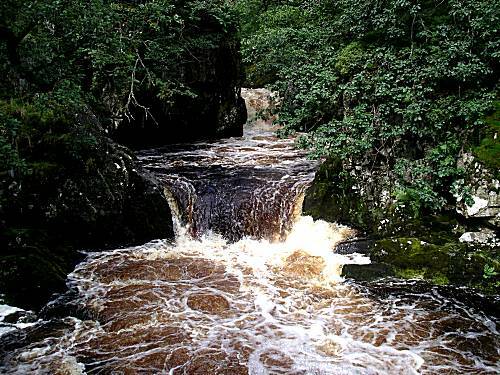 The route took the walkers back to Ingleton, where they elected to take the Riverside walk past "Snow Falls", despite the flooded conditions. However, DISASTER STRUCK, on the approach to the falls, when Brad rapidly disappeared from sight whilst visiting some bushes to relieve himself. Closer inspection found Brad wedged between the bank and the roots of the trees which were some distance below the path on a steep bank down to the river. Although some of the walkers felt that he should be left there, the more responsible ones attempted to retrieve him. This proved a difficult task taking three people to drag him back the path. Nothing but his pride was hurts, except for a small cut on his face and much mud all over him!! 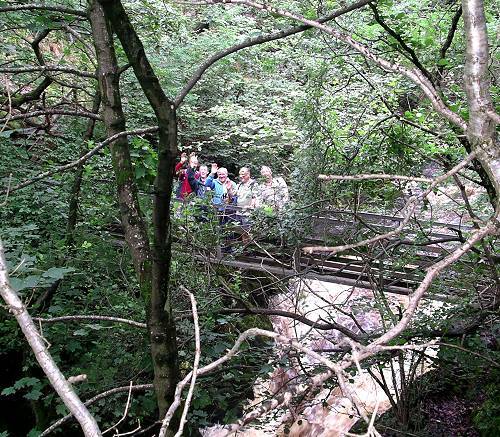 The walkers were amazed by the amount water coming down the falls in the flooded conditions. The walkers were pleased to reach their cars after a hard, but enjoyable days walking and agreed to meet again in 3 weeks time for another walk. Walkers: Paul (Leader), Cliff, Alan, Ron, Brad & Neil. The walkers met adjacent to the level crossing at Finghall. Paul, with the Thoralby contingent, arrived late, due to the him overshooting the turn to the village by some two miles!! Ron's bacon and sausage butties were enjoyed before the walkers set off up through the village, admiring the "Queens Head", which was rumoured to provide a good pub food fayre. The route, familiar to some of the walkers, continued past the Thornton Steward Reservoir, with its extensive yachting facilities, and on through the village to take the track towards the river, passing Danby Hall and Church, before reaching the Coverbridge Inn. Electing to take the footpath down to the side of the River Cover, the walkers were horrified to find an official notice from the Council announcing that the footpath was closed. The walkers expected this to be caused by erosion of the bank., which they had witnessed during previous walks. However, they ignored the closed sign certain that they would be able to find an alternative route. The footpath was indeed very narrow with only a few slippery footholds between the sheer drop to the river and an electric fence on the other side. No walkers were lost during this difficult manoeuvre. Fearing that the walk might prove a little too short, the route was modified to take the walkers up onto the Middleham Gallops, where they watched a light aircraft make an approach and landing into a private airstrip on one of the farms. The walkers considered that this was most probably a means of transport used by Pork Pie smugglers and therefore chose not to report the matter to the authorities. 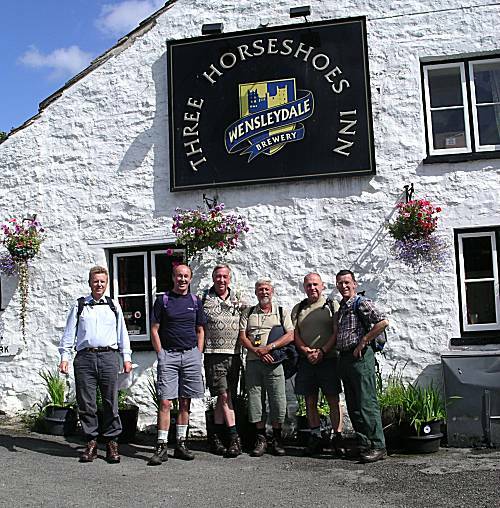 After finding a direct route to Wensley, the walkers quickly arrived at the Three Horseshoes, where they settled in the sunny garden area to enjoy Timothy Taylors Landlord Ale with some bowls of excellent chips. 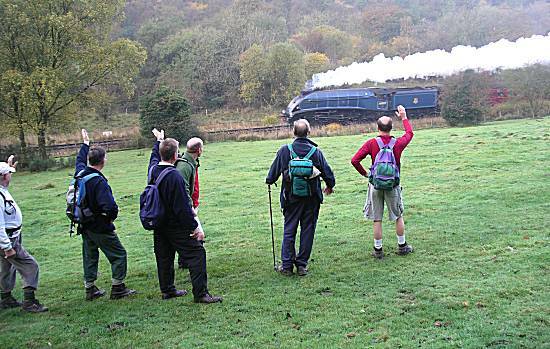 The walkers were anxious not to miss the last train back to Finghall from Redmire station and left the Three Horseshoes at 2-15 for the 3½ walk to the train. The walkers were quick to locate Bolton Hall, where they stopped briefly to admire the magnificent building and grounds. The walkers were intrigued to find that the train would be hauled by steam locomotive back to Finghall and hurried to purchase their train ticket. They were astonished to be told by the lady that she had no idea what the single fare would be. 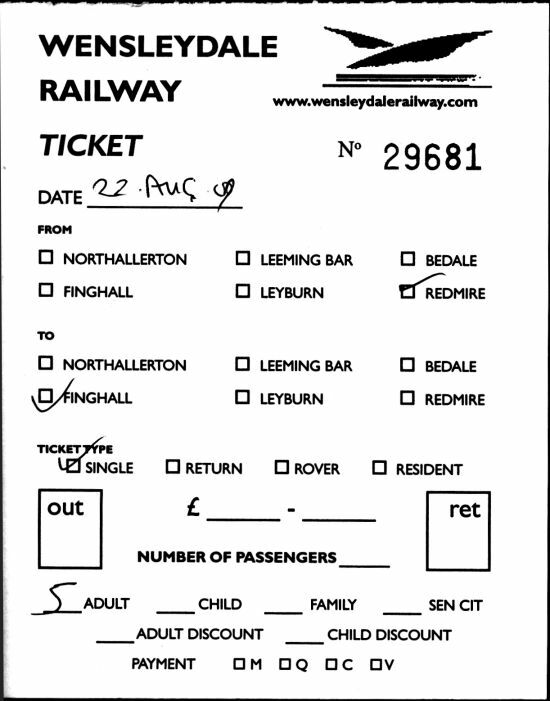 They were instructed therefore to purchase the ticket on the train. 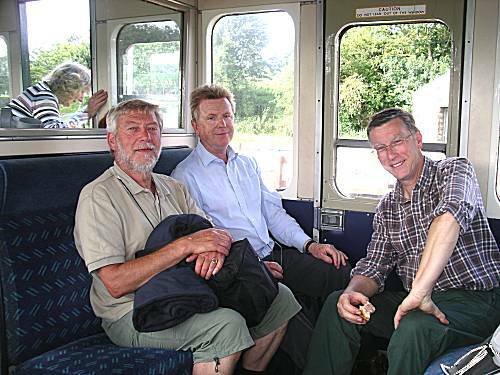 They therefore took their seats and waved good bye to Cliff, who had cunningly left his car at the station so as to get a quick getaway at the end of the walk. 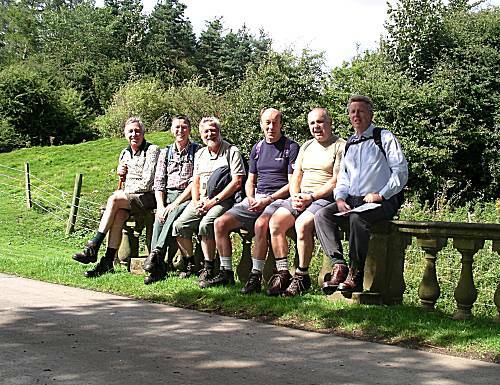 The walkers relaxed in their seats knowing that the difficult part of their walk had been successfully completed. 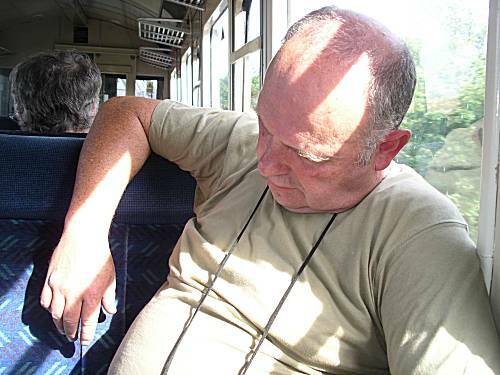 However, the combination of much walking with good ale, pork pie and chips took its toll on one of the walkers. 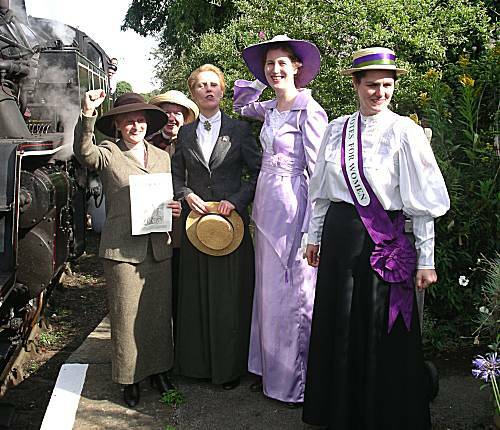 The walkers considered that the isolated village of Finghall must have become a little lost in time, when the train was met by a number of Suffragettes demanding "Votes for Women". The walkers were quick to leave to station, in case one of the women might throw herself in front of the train. Walkers: Paul, Andy, Cliff, Alan, Ron & Neil. 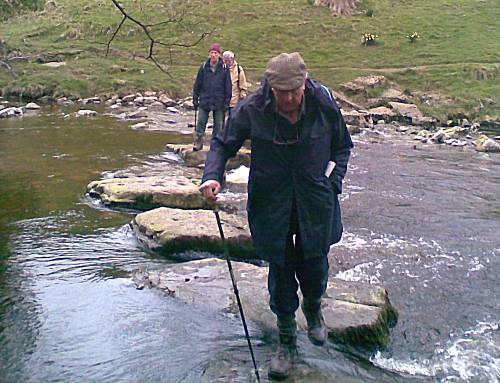 Paul had designed a cunning two stage 'figure of eight' walk to test the walkers ability. They gathered on the village green at West Burton opposite the Village Hall and quickly devoured Cliff's excellent Bacon & Sausage butties. They departed through the village, crossing the river and heading relentlessly upward along long tracks running parallel to the formidable Penhill. Eventually they joined a steep road towards the top, before crossing a field to make the steep final ascent to the very top where, adjacent to ruined building, the jubilant walkers, posed for a group photo. The hill proved long and flat on the top as the walkers made their way to the side overlooking Thoralby where they rested to enjoy the splendid view and share their first pork pie. 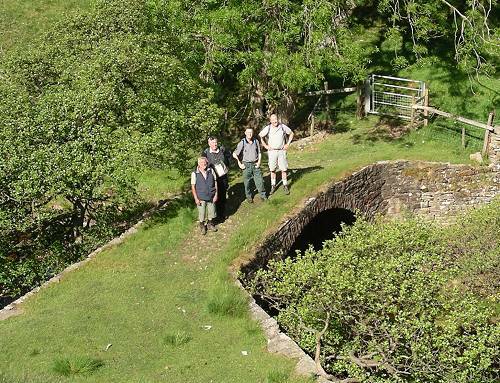 The descent proved equally long and arduous as they wound their way down to join a rough rocky road past Cote Bridge to eventually reach an old lead smelting chimney, where they rested to enjoy their sandwiches, dismissing all thoughts of cremating Brad in the fiery furnace of the lead mine. By 12-30 they found themselves back in the village of West Burton having successfully conquered Penhill. They found need to visit the Fox & Hounds overlooking the village green, where they sat outside enjoying a few pints of ale with some excellent chips. The walkers were reluctant to pass their cars at the start of the second stage of the walk, which looked like a short excursion to the south west, but soon found that, like the morning, it involved a significant amount of climbing. Vast areas of recently felled forest were walked which proved difficult underfoot. The route eventually met a road and then headed down toward the river, which was followed all the way back towards the picturesque West Burton waterfalls. 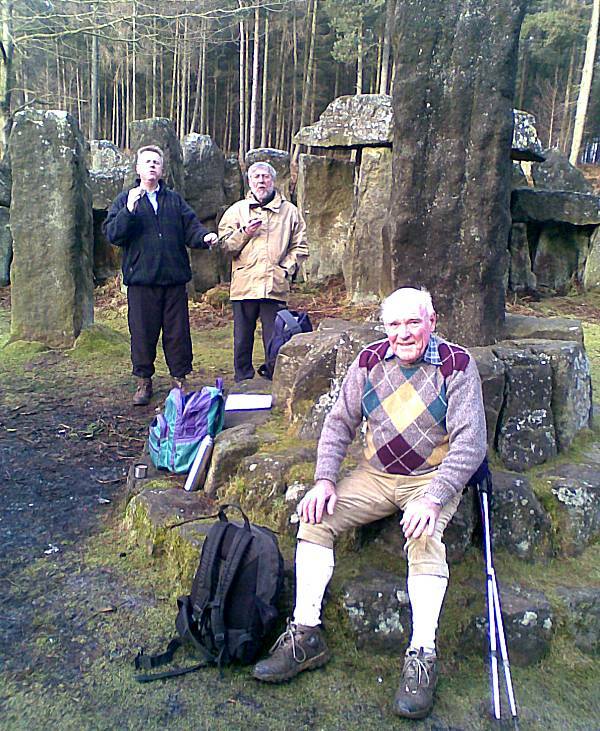 Here the walkers shared their last pork pie before heading back to their cars. All agreed it was an excellent walk, although Brad declared it very tiring, but had completed it without falling. Weather: A warm and pleasant walking day, with a threat of rain in the afternoon, which never materialised. 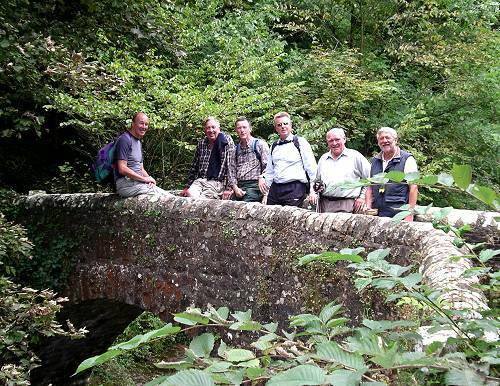 Walkers: Paul (leader), Andy, Cliff, Brad, Alan, Ron & Neil. NEWTONDALE TRAIL - Saturday 17th October "Newtondale Trail - Wartime Weekend"
The eager walkers arrived in Pickering well ahead of schedule and quickly made their way to park in a residential road near the castle, where they enjoyed Ron's excellent Bacon and Sausage butties. They set off at about 8-20am making a good pace along the familiar route as they compared between themselves how many years they had completed this epic walk previously. 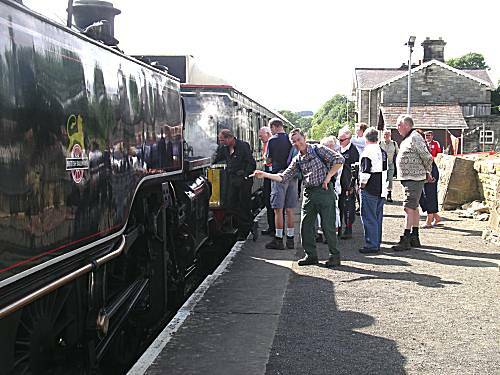 The walkers reached Hudsons Cross in record time, but knew this indicated the start of the treacherous decent to Newtondale Halt and the equally difficult forest climb to reach Newtondale Moor. DISASTER OCCURRED - When Brad suffered extreme cramp while making the treacherous decent into Goathland. Sean was quick to administer first aid, while Alan observed. The remainder of the walking party failed to stop and marched on unconcerned, where being within a couple of miles of the lunchtime pub they could already sense the ale. 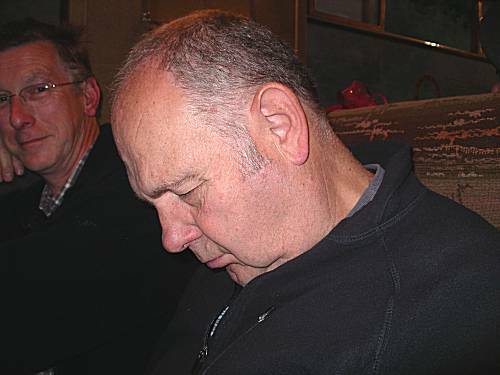 Most the non-drivers enjoyed 5 pints of an excellent guest ale at the Birch Hall Inn also many purchased small portions of pie and pickle, as the 'Pie Monitor' Andy was absent from the walk. 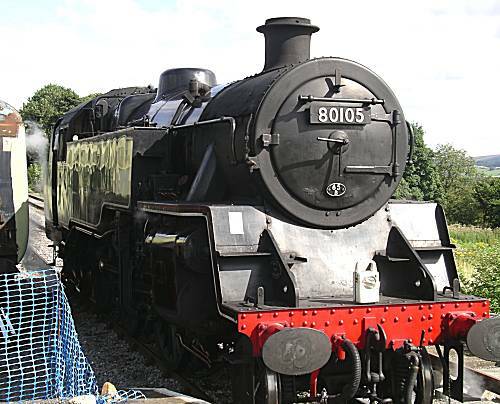 Brad's son Mark with his son joined the walkers, before they left to tackle the final section of the walk to Grosmont where, after absorbing much of the 'Wartime Atmosphere', they boarded the 16:50 back to Pickering. . 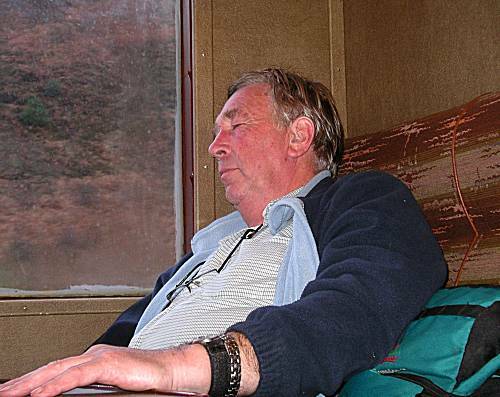 The exertions of the day told on the walkers as they one by one fell into a deep relaxing sleep, only to be rudely awoken as the train ground to a halt at Pickering. The walkers left Alan's House at 8-30am to tackle the infamous Sunday Loop on a Saturday. They carefully made their way along the familiar walk, that was regularly used as a practice walk leading up to the 100miles LDWA walks in the 90's. 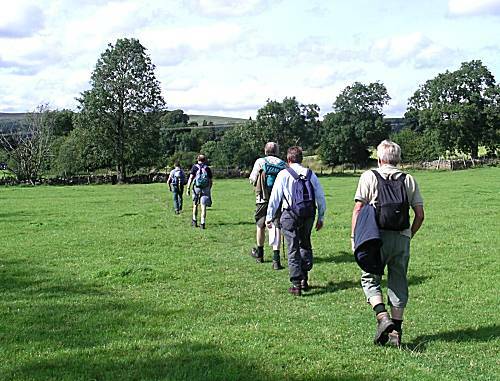 With recent rain the footpaths proved very muddy and the River Wharfe was close to flood, but the walkers showed no fear. After the long road section, which proved much busier than they remembered on a typical Sunday, they trudged onwards across a field, where the footpath has been illegally, ploughed up by the local farmer. Colin declined to visit the farmer to correct his ways. After almost becoming stuck in the very deep mud, the walkers slowly made their way up the hill into Kirby Overblow, where they were quick to visit the Star and Garter. However, the walkers did not find the ale (too cold) or the surroundings (set out for diners only) to their likings and after only 1 pint set off in the rain towards Spofforth. The walkers arrived back at Alan's house in high spirits and agreed to meet again on 12th December for a further daring walk. 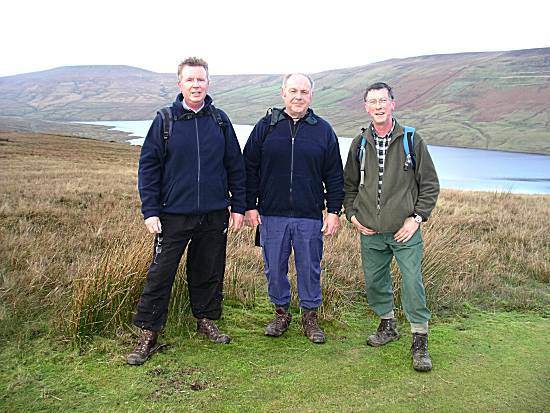 Only four brave walkers were prepared to take on Paul's Scar House Reservoir Walk and met at a small car park on the long access road to the reservoir, shortly after passing Lofthouse. Ron's excellent Bacon and Sausage butties were consumed before the walkers set off to tackle the massive climb towards the Shooting Lodge, which was well known to the walkers who had previously completed the Pateley/Lofthouse walk. 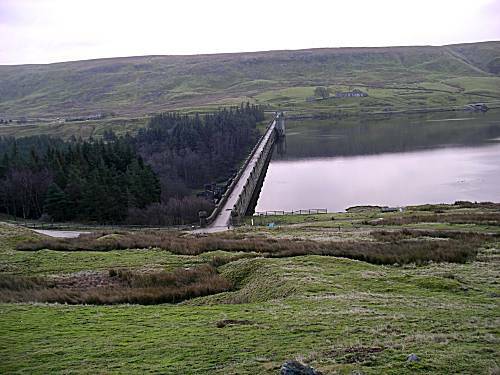 However, the climb took the walkers north of the Lodge and followed an elevated route west towards the reservoir. Knowing that their pork pie would be shared between only four walkers, they skipped in eager anticipation looking for a suitable stopping place to consume their food. Cunningly after crossing the Angram Reservoir dam, they located a shelter to enjoy their break and pie. 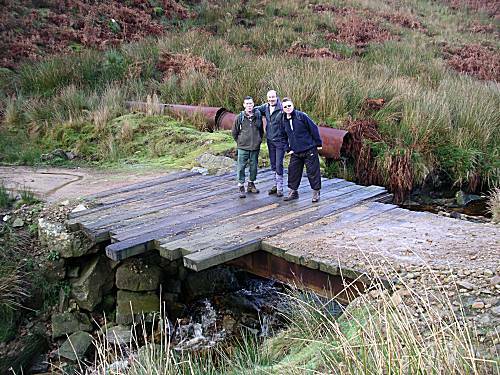 As is customary, the walkers accurately located any form of bridge and gathered whilst Alan recorded the event in traditional fashion. 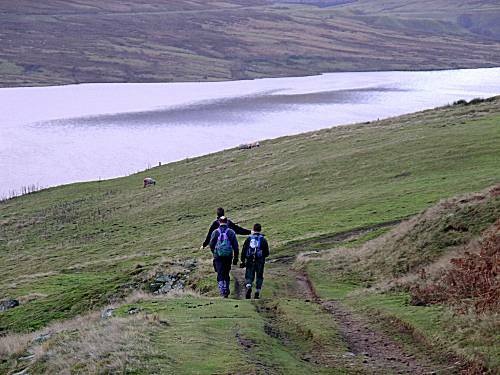 As the route took the walkers upwards, the reservoir was soon well behind them, but their spirits remained high as they knew 'The Crown' at Middlesmoor was not far away. After some discussions about the best route back to the cars, the walkers disobeyed their leader, by taking a track known to several of the more experienced walkers, which quickly proved to be the most direct route. 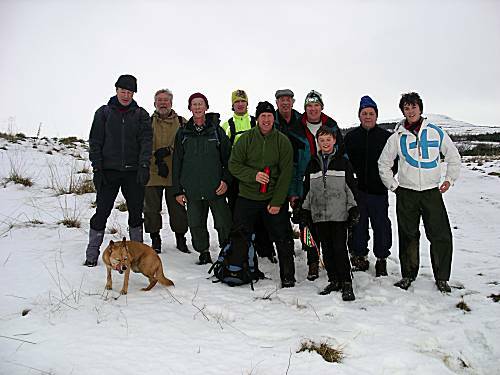 The walkers agreed the walk was very enjoyable and all agreed to attend the Christmas Coverdale walk after Christmas. An excellent turn-out of eleven walkers arrived at the familiar grass verge just south of Leyburn, where Ron handed out strength promoting Bacon and Sausage Butties. 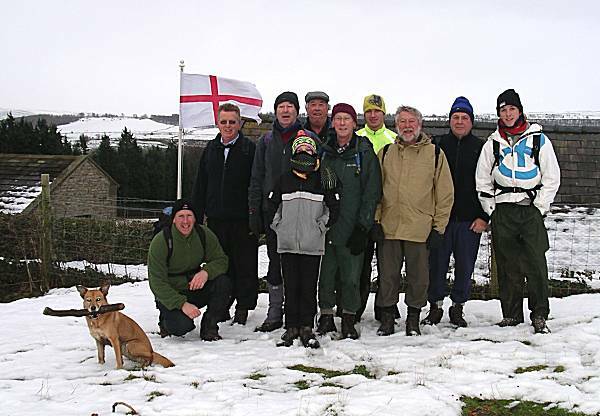 The group set off in good spirit over snow covered fields towards Leyburn. They walked through Leyburn resisting the temptation to stop at the newly opened bakery, displaying a good selection of pastries, before joining the "Leyburn Shawl" footpath in cold and snowy conditions. 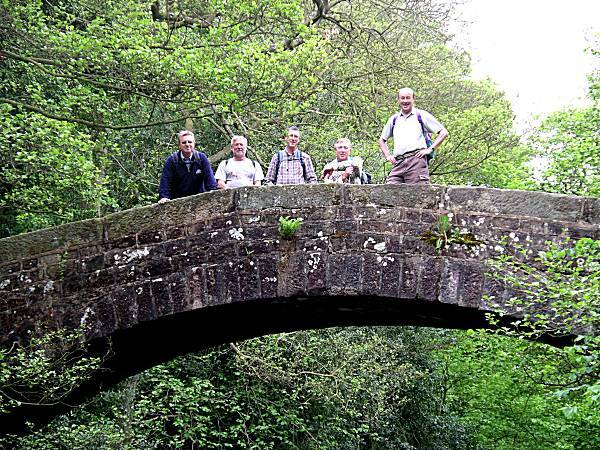 The hardened walkers soon reached Preston-under-Scar, where they turned downhill to pass near to Bolton Hall, stopping at Lords Bridge for refreshments and Alan's Mars Bar Crispies. Oscar (aged 11) ran ahead to find strange creatures in the forest whilst his Father considered ways to restrict his activities (permanently). DANGER AHEAD - On nearing the lunchtime stop at the Coverbridge Inn, it was noted that the footpath remained closed following an earlier collapse into the river. However, the cunning walkers devised a plan that necessitated the crossing of an electric fence in two places. 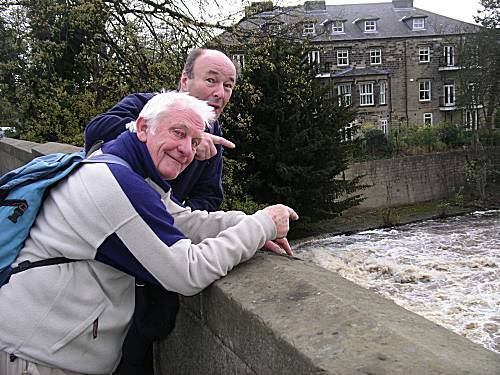 With great courage Cliff held the electrified fence wires down to enable the walkers to avoid certain death, however, Paul considered that he could find a better location to cross on his own. 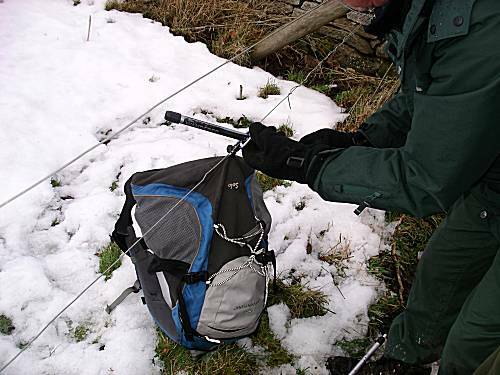 DISASTER OCCURRED - Paul decided to crawl underneath the electric fence, not realising that the buckle clip on his rucksack had firmly attached itself to the electrified wire and snapped back closed. The other walkers failed to release him and were greatly concerned that this might curtail their lunchtime refreshments. Attempts to release the clip without receiving life threatening shocks failed and the walkers contemplated whether Paul should be considered expendable. 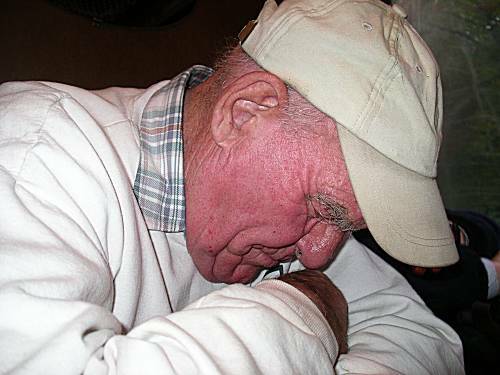 Much Timothy Tailors Landlord was consumed by the walkers at the Coverbridge Inn, before the barrel ran dry. 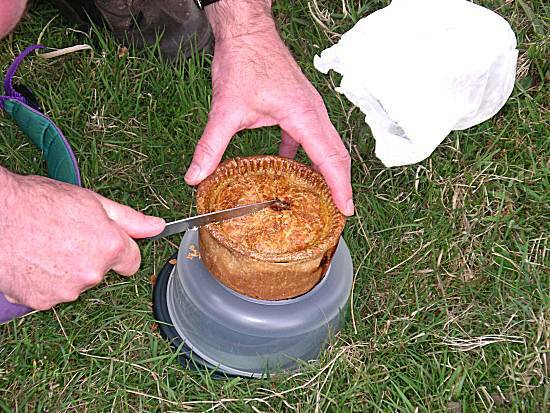 The walkers feasted upon Cliff's excellent homemade game pies (One with Pheasant) accompanied by ample chips. 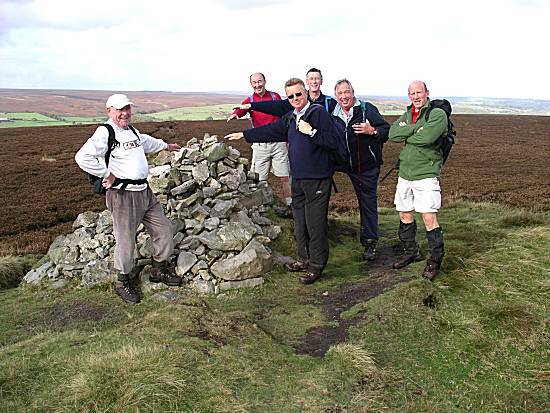 A guest appearance by Tom greatly lifted the spirits of the walkers, who question him as to why he had not walked with the group over the proceeding year. Many of the walkers were dismayed by the early departure from the establishment to complete the final stage of the walk back to the cars in light snow. 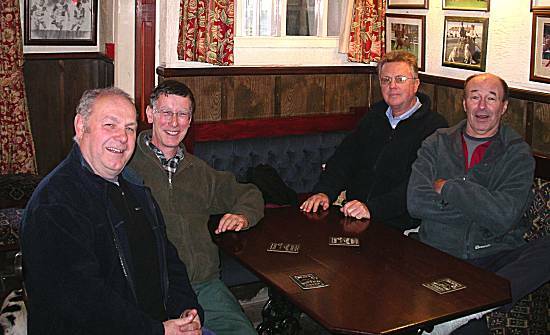 Despite this disappointment, all agreed that this was a very successful end to the 2009 walking diary. Weather: Very cold and windy in places, walking the entire route though much snow. 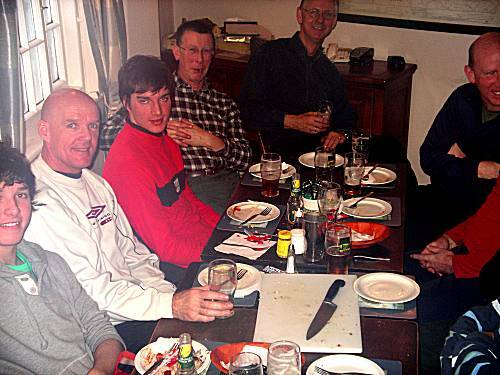 Walkers: Ron, Neil, Alan, Sean, Paul, Andy, Cliff, Mark (Brad's son) with his 3 sons and Ella the dog. Guest appearance by Tom at the Coverbridge Inn.